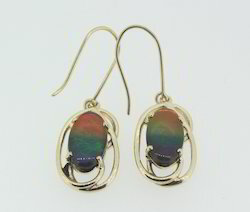 We are a leading Manufacturer of ammolite pendant in 14k yellow gold, ammolite dangling earrings in 14k gold, ammolite stone jewelry, ammolite gold pendant and ammolite and diamond gold ring from Jaipur, India. 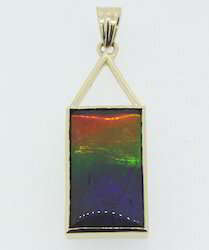 By integrating our expertise in designing, we are providing a wide line of Ammolite Pendant in 14K Yellow Gold to our revered customers in the market. We can also customize the article if requested and use gold or silver. Our professionals use the best quality gold and modern machine for manufacturing this product. 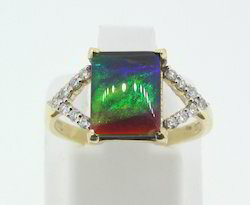 We are renowned firms of market for providing the best quality series of Ammolite Stone Jewelry, which is enormously employed in the industry owing to their top features. We ensure that the product we offer lasts long and fulfill the requirements of our customers to the utmost. They are a perfect match with formal attire on special occasions or with casual wearing. 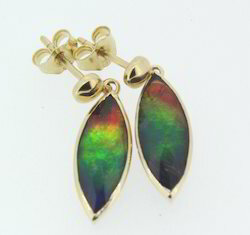 Being a noteworthy enterprise of this industry, we are offering a wide spectrum of Ammolite Gold Pendant. Owing to their traditional designs, these stones are widely demanded by the customers. Our professionals use the best quality gold and modern machine for manufacturing this product.